My knitting saga seems to never end. Lately I’ve been working hard to finish my Orkney Pi shawl. 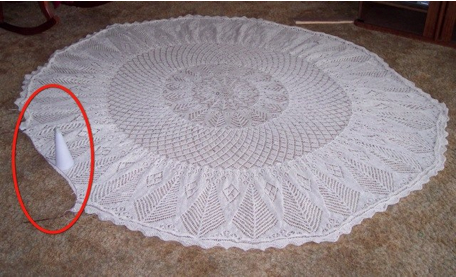 I had it all finished except the knitted-on edging when I set it aside months and months ago. I recently picked it back up and started working on the edging. I had hoped to have it finished by the time the Stanley Cup finals were completed. I have good news and bad news. First, the good news. The Pittsburgh Penguins won the Stanley Cup. Their captain, 21-year-old Sidney Crosby, got to hoist the cup. It was an amazing playoff series for the Pens. They had to get by the Philadelphia Flyers first; then they faced the mighty Washington Capitals. The next obstacle was the Carolina Hurricanes. As Eastern Conference champs, the Pens won the Prince of Wales trophy and the privilege of playing the Detroit Redwings in the final round of the Stanley Cup play-offs. The Detroit Red Wings are, or at least were considered by most to be the best team in the NHL. Last year the Pens squared off against the Wings in the finals and went down in six games. But the Pens are a different team this year. In February, they appeared to be out of the playoffs altogether. But a change in head coach, from Michel Therrien to Dan Bylsma, along with some great play from their youngsters and the addition of a couple of veteran players, turned things around for the Pens. All of a sudden, they were back in the playoff picture. They just kept getting better and better. The hockey playoffs are intense, to say the least. The players give their all every game, and they don’t get much rest between games. They do a lot of traveling. It’s tough, to say the least. The final round opened with two games in Detroit. The Red Wings won both, but the Pens played well and many of the Penguins players thought they had out-played the Wings in both games. Next there were two games in Pittsburgh, and the Pens won both. Series tied, two games to two. Back to Detroit. The Pens had a terrible game and lost 5-0. Back to Pittsburgh for game six. It’s a must-win game for the Pens. If they lose the game, they lose the championship. If they win, they go back to Detroit for a chance at the coveted silver trophy known as Lord Stanley’s Cup. The Pens win, so now it becomes a one-game series. In Detroit. On the Red Wings’ home ice. Where the Wings rarely lose. Yikes! In spite of a knee injury that kept Sidney Crosby from playing for most of the game, the Pens played brilliantly and, in the face of an end-of-the-game offensive onslaught from the never-say-die Red Wings, when the final buzzer sounded, the Pens had two goals to Detroit’s one. The Pens know how to finish a game, how to finish a series, how to finish a season. I only wish I could say the same for myself. My Orkney Pi is still unfinished. It isn’t my fault. Really. It isn’t. Here’s the bad news to go with the good. My Orkney Pi shawl isn’t finished. 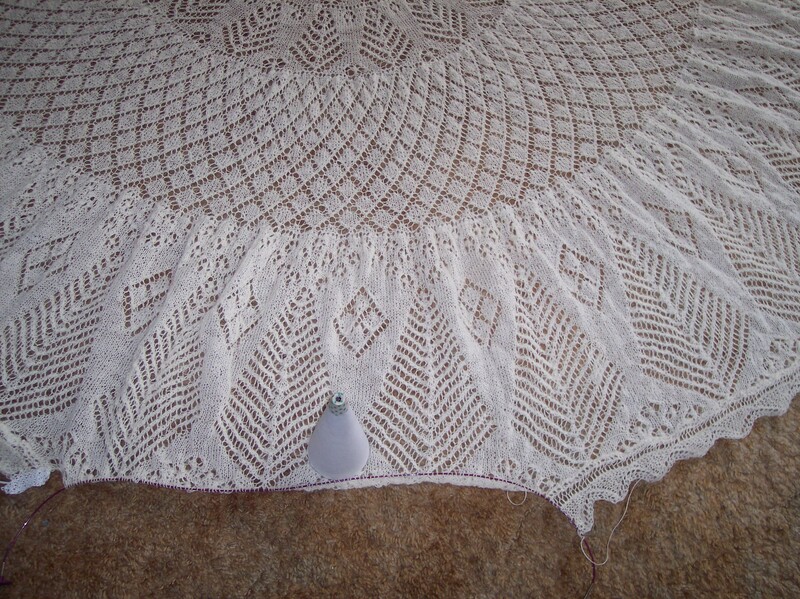 There are 32 trees in the final pattern section of the shawl. I had used up 29 of them when the unthinkable happened–I ran out of yarn. When I cast on for this shawl, I had a 450-gram cone of Jamieson & Smith’s Shetland Supreme 2-ply, 3937 yards of luscious Shetland wool. That’s over two miles of yarn! How could I possibly not have enough yarn? But never fear, more Shetland Supreme is winging its way from England as I type, 50 grams, 437 yards. That should be plenty to finish up three more trees. Once the yarn arrives, my Orkney Pi will be finished in no time. Congratulations, Pittsburgh Penguins. You’ve only just begun!